If you’re looking for a home espresso machine it can be difficult to know where to start. Espresso machines vary greatly both in their features and their price tag. At the higher end of the price range for entry-level models, you’ll find the Breville BES840XL/A the Infuser. The Infuser is generally classified as a semi-automatic espresso machine. It provides you with everything you need to make an astounding cup of espresso, though it will take some practice to hone your skills. What makes the Infuser stand apart from other similar espresso machines is that it boasts some great features usually only found on higher-end models. Let’s take a look at what this espresso machine has to offer. A feature borrowed from the higher end espresso machines in Breville’s product line, the BES840XL/A the Infuser starts the extraction with a low-pressure infusion to saturate and expand the grinds before ramping up the temperature. This ensures an even and balanced extraction yielding full flavors from your coffee beans. The temperature of your extraction has a huge impact on the flavor of your resulting espresso. Extraction temperature on this unit is adjustable within 2˚C, and the water heating system utilizes PID control to provide stable and consistent temperatures throughout the extraction. This level of control sets it apart from other espresso machines in its class. When you’re finished brewing your espresso you’ll see that the Breville BES840XL/A the Infuser has a “dry puck” feature. This means that when the extraction is complete, the machine can dry out the coffee grounds. Rather than being left with slurry, you’ll have a nice, dry coffee ground puck that you can easily dispose of in the waste bin. A great feature when making multiple cups of espresso at once, the Breville BES840XL/A the Infuser comes equipped with a cup warmer on top of the machine. Use it to preheat your espresso cups prior to extraction, and to keep your additional espresso shots warm as you are finishing up a batch. Breville chose not to skimp on quality where it’s needed most. The Infuser comes with a 54 mm stainless steel portafilter so that you can load, tamp, and extract over and over again without worrying about excessive wear and tear. What’s more, it has the appearance of a professional portafilter so you’ll look like a bonafide barista. It’s not always convenient to pour water directly into your espresso machine. You’re fairly likely to miss and spill at the very least, and with electrical components and outlets on your countertop it could even be a hazard. 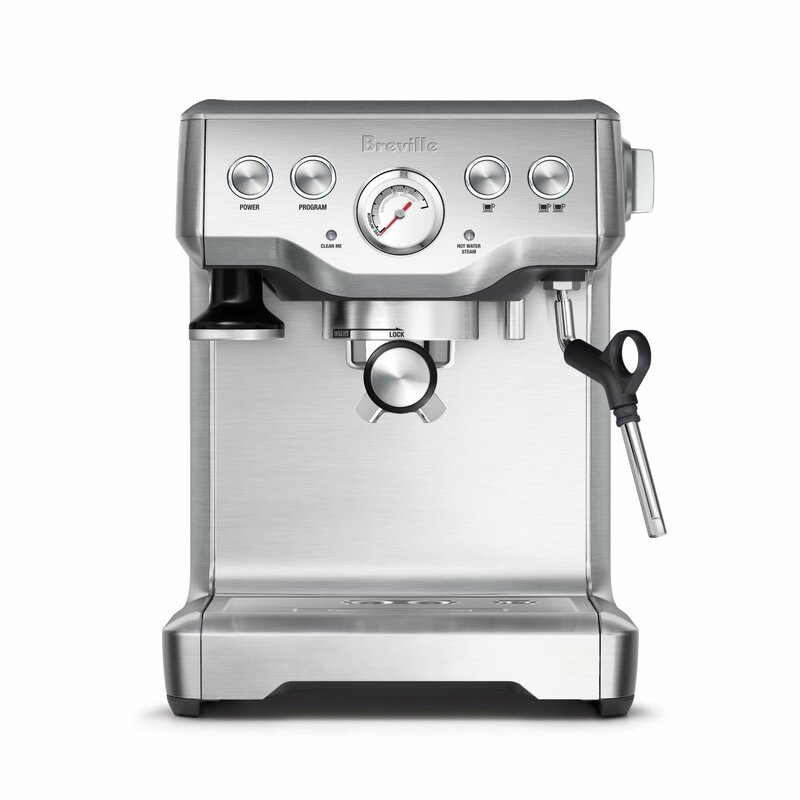 The Breville BES840XL/A features a removable water tank that holds up to 61 ounces (a bit shy of a half-gallon). Often times you’re in a rush as you leave the house for the day, and you may find yourself asking questions like “did I forget to turn off the coffee machine?”. The Breville BES840XL/A will go into “sleep mode” after an hour of inactivity. If the machine isn’t used for three hours it will shut off entirely. You still shouldn’t make a habit of leaving your espresso machine on, but when accidents happen this machine has your back. If you’ve ever used an espresso machine before, you’re probably familiar with how easy it is to spill coffee, milk, or steam while you’re working away on your cup of espresso. The Infuser from Breville comes with a removable drip tray so that cleaning up is a breeze. Better yet, the machine will even alert you when it’s full with an “Empty me!” indicator. High-precision temperature control with the assist of PID technology makes for consistent cups of espresso. Hone in the right temperature for your coffee beans for optimal flavor. The pre-infusion feature, often reserved for higher end espresso machines, thoroughly saturates the grinds with low-pressure water so that they have time to expand prior to the final extraction. This yields a more balanced flavor profile. Includes both dual-wall filters for users with less experience making espresso and single-wall filters for users who have been making espresso for a while and are seeking a bit more challenge in the art form. The built-in pressure gauge allows you to keep an eye on the pressure applied during the extraction so that you can make adjustments on the fly to achieve a rich and flavorful cup of espresso. The dedicated hot water spout delivers clean, hot water so that you can turn your espresso shots into an americano by diluting to your desired final volume. Some users report that it can be difficult to find replacement parts for this machine. While it is a seemingly well-designed product, this can be a potential issue if one of the components malfunctions after the warranty has expired. When you take all of the features of the Breville BES840XL/A the Infuser into account, it’s easy to see why it comes in at the higher end of the price range compared to similar espresso machines. Features such as the pre-infusion technology and the PID temperature control are far less common when it comes to the more basic home espresso machines. Other small features are less central to the functionality of the espresso machine but they are still quite convenient. The cup warmer on the top of the machine is a nice touch that will remind you of commercial espresso machines found in coffee shops. The puck dry feature and the removable drip tray with the “Empty me!” indicator are sure to make cleaning easier than ever. The inclusion of precise extraction temperature control and pressure monitoring gives you everything you need to become a more advanced barista, so this machine is something you can grow into. If you’re relatively new to the world of home espresso and you’re looking for something a little bit nicer than the baseline then the Breville BES840XL/A the Infuser may well be the espresso machine for you. That said, there are more affordable espresso machines in this class out there, but if you can spare the extra expense then there’s a good chance you’ll be happy with this model.